We invite you to virtually explore The Eye of the Beholder: Decade-Defining Lids, Lashes, & Brows. Here, you can read the complete exhibition narrative and see each object up close. Start with the introduction and travel through the time chronologically, or jump ahead to your favorite decade. Arguably the most distinctive feature of the face, eyes possess the power to dramatically transform one’s outward appearance and uniquely convey inner character. Highly expressive, they serve as nonverbal communicators of emotions, ranging from sympathy and envy to fear and flirtation. Since ancient times, people have sought to enhance their lids, lashes, and brows through preening and the application of cosmetics. Though makeup was inextricably linked with the demimonde in the prior centuries, the 1900s brought products from theater and film into the mainstream. By mid-century, the beauty industry had gone global, and its consumer conveniences were expanding as rapidly as its trends. In just 100 years, there have been moments where the deceit of eye makeup had to be subtle and persuasive, and others where the painted-on visage was not only preferable but also liberating. Companies have tapped into the muses and zeitgeist of each era to perpetually create the prevailing look, often reviving past styles in the process. Although eye aesthetics are ever changing, the pursuit of “ideal” beauty – whether paradoxically natural or conspicuously artificial – is remarkably enduring. 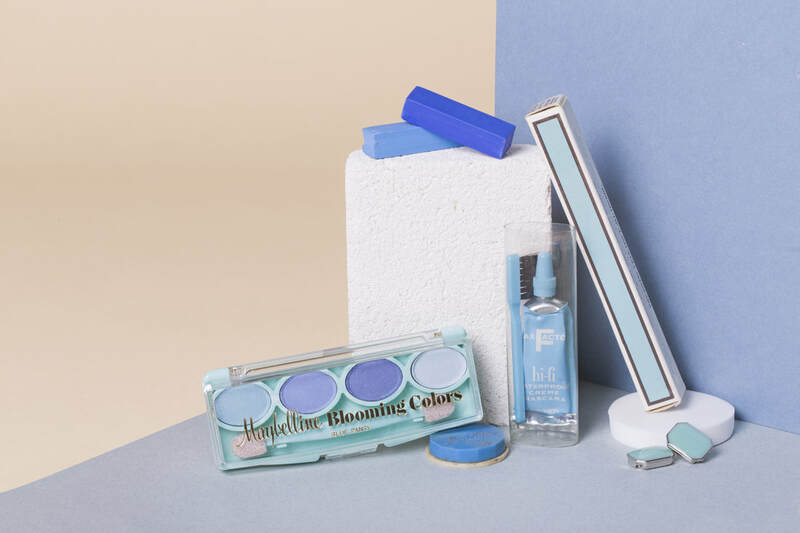 Image credit: Maybelline (Now Maybelline New York, American, founded 1915), Blooming Colors Eye Shadow Bouquet in Blue Pansy, ca. 1972; Maybelline, Cream Eye Shadow in Blue, ca. 1943–1949, Courtesy of Maybelline New York; Max Factor (American, founded 1909), Hi-Fi Waterproof Creme Mascara with Brush in Brown, ca. 1957, Courtesy of the Max Factor Archive Collection, Coty Inc.; Max Factor, Brush Tip Lash-full Mascara in Brownish Black, ca. 1965 (shown in packaging), Courtesy of Max Factor Archive Collection, Coty Inc. Photo by Heidi Bohnenkamp for NYU Costume Studies, 2018. Image © Heidi Bohnenkamp.